Add a good bottle of wine to mac ‘n’ cheese, and every generation’s happy ― but the right one depends on the dish. With our Ultimate Mac ‘n’ Cheese recipe featuring gruyère and aged gouda, try Pinot Gris, popping with lemon and minerals, or dry Chenin Blanc with crisp green apple playing off the gruyère. With a classic cheddar version: earthy, herbal, smooth, dark-fruited Merlot. 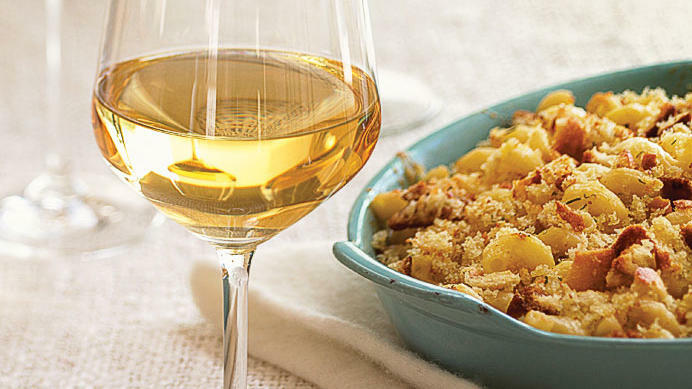 And with either dish: sparkling wine with toasty apple flavors, which makes sense ― think apple pie and cheddar.